This booklet covers much the same ground as an earlier booklet, Choosing Separate Ways. Here the focus is more on the sequence in which events occurred rather than about persons of interest. Trying to focus on both goals at the same time proved too difficult. Putting together a time line one hundred years after the fact is somewhat akin to building a 3-D model of an item with only a 2-D photograph to guide you. It may appear more accurate than it really is because we cannot see everything clearly. It is, however, to the best of my knowledge, accurate. So, with that disclaimer, we proceed. In early 1906 a construction company used the lower floor, the barn-like part of the old church on Azusa Street, as a warehouse of sorts. It is not clear whether they rented it or used it by permission or maybe the materials were leftover from remodeling or repairs. A “For Sale” sign decorated the outside of the building. Strong evidence is that at the end of March, or the first of April, Seymour’s prayer group began sharing the space of the lower floor in the old church on Azusa with the construction materials. There was room enough somewhere in the 40 by 60 foot structure for a circle of chairs and that met the needs of a three o’clock afternoon prayer meeting. A home on Bonnie Brae Street was used for the evening prayer meetings, but was not available during the day for ‘tarrying’ meetings. Continuing from the above quotation in The Apostolic Faith we read, “Here [in the barn-like room] about a dozen congregated each day, holding meetings on Bonnie Brae in the evening.” Notice that “about a dozen” attended meetings in the afternoon because daytime meetings could not be held in the Asbery home. The group that met in the evening was probably larger than the afternoon group; that would be quite a normal situation for working people. Sometime during this week, or perhaps on the last day of March, Seymour called for Ten-Day-Tarrying meetings. This necessitated the use of the Azusa Street church building, as the home on Bonnie Brae Street could not be used for prayers during normal daytime activity there in the home. Lucy Farrow and J. A. Warren arrived from Houston, Texas about this time. Farrow had already received the baptism of the Holy Ghost as evidenced by speaking in tongues, but we are not sure about Warren. It is our guess that the start of the ten-days-tarrying meetings was a result of, and coincided with, these reinforcements arriving from Texas. This is the day referred to by Seymour when he said, “The beginning of the Pentecost started in a cottage prayer meeting at 214 Bonnie Brae.” This quotation is from the front page of the first issue of the church paper. There is a conflicting story about how Pentecost began at the home of Edward Lee instead of in the cottage meeting in the home of Richard and Ruth Asbery at 214 Bonnie Brae. We choose to go with Seymour’s statement, noted before, and discount the other story which conflicts with the account by Seymour, and with the above paragraph. This previous quotation also settles another question sometime raised about whether Lucy Farrow came to Los Angeles before April 9th. Sometime during this week the small Azusa group arranged to rent the lower floor of the Azusa Street Church. By Saturday, April 14, the construction company had mostly cleared out, and even helped the new tenants to get set up. On Wednesday, the Los Angeles newspaper reported weird sounds filling the night, coming from an old tumbledown shack of a church on Azusa Street. They were referring to the Tuesday evening Apostolic Faith church service there at Azusa. This was just eight days following the April 9th experience, widely publicized in Pentecostal circles as the beginning of the Latter Rain Outpouring of the Holy Ghost there in Los Angeles. And indeed, from the evening of April 12 when Seymour received his Spirit baptism until the evening of April 14 when they had obtained possession of the lower floor of the Azusa Street church, little time is left for doing anything else. Stories that Seymour stood on the front porch of the home on Bonnie Brea and preached to hundreds crowded on the porch, in the yard, and standing in the street seem exaggerated. Some think that after attendance at Azusa had increased to hundreds of people, the evening services were again moved back to the home on Bonnie Brae for a time to allow for repair and/or remodeling of Azusa, but this seems neither reasonable nor feasible. Some have supposed that the time frame mentioned (“Here about a dozen congregated each day, holding meetings on Bonnie Brae in the evening.”) occurred after April 9th. Let’s examine this concept more closely by first rereading that part, and a little more, of the editorial. "The meetings are held in an old Methodist church that had been converted in part into a tenement house, leaving a larger unplastered, barn-like room on the ground floor. Here about a dozen congregated each day, holding meetings on Bonnie Brae in the evening. The writer attended a few of these meetings and being so different from anything he had seen and not hearing any speaking in tongues, he branded the teaching as third-blessing heresy, and thought that settled it. It is needless to say the writer was compelled to do a great deal of apologizing and humbling himself to get right with God. "I dropped into the meetings on Azusa Street some time in April, having heard that some people were speaking in tongues, as they did on the day of Pentecost. Although I had been trying to preach Pentecost for five years, the speaking in tongues was as strange to me as though it had never been mentioned in God's word. At first the meeting seemed a very tame affair to me, as I had been along the line of much fleshly demonstration and noise. As I was indoctrinated in the second blessing being the baptism with the Holy Ghost, I branded the teaching as heretical, not going to the meetings for some time. Here, the wording, "In the meantime, Pentecost came to the place," tells us that the writer's first encounter with the group at Azusa was prior to April 9th. From the phrase "... Having heard that some people were speaking in tongues, as they did on the day of Pentecost." we can conclude that news of the arrival of Lucy Farrow and J. A. Warren at Azusa from Houston, Texas sparked this response. Their testimony accounts for word being spread around that some people were speaking in tongues, as they did on the day of Pentecost although there is no record of anyone speaking in tongues at Azusa or Bonnie Brae before April 9. Additionally, we note that the writer said, “Here about a dozen congregated each day, holding meetings on Bonnie Brae in the evening.” We would not expect an afternoon meeting to be as well attended as an evening meeting, but even so, this number (about a dozen) indicates it was probably the original prayer group. Still further evidence comes from issue 4 of The Apostolic Faith paper in the lead editorial on page one. It states “Then they felt led of the Lord to call Bro. Seymour from Houston, Texas to Los Angeles, the saints in Los Angeles sending his fare. It was as truly a call from God as when He sent His holy angel to tell Cornelius to send for Peter. He came and told them about the baptism with the Spirit, and that every afternoon at three o'clock they would pray for the enduement of power. He told them he did not have the Pentecost but was seeking it and wanted all the saints to pray with him till all received their Pentecost.” From these comments it seems probable that both editorials were written by the same person, one who had not himself attended the evening cottage prayer meetings on Bonnie Brae Street, but was telling of the events before April 9, 1906. These preceding articles taken from The Apostolic Faith published by Azusa are the basis for claims made herein that Azusa housed an afternoon prayer meeting prior to April 9. Not everyone will agree with our conclusion, but that is fair. We try not to confuse evidence with the conclusions we drew from those evidences. A circle of chairs was sufficient for the pre-April 9 afternoon prayer meetings, but after April 14, stacking two shipping boxes, end on end and with the open sides toward the preacher, made a pulpit, and chairs and benches were then placed in rows facing this new pulpit. Later a cloth would be draped over the two-box pulpit. "We earnestly invoke God to manage the publication of this sheet and He is editor-in-chief and business manager. We publish it with the clear leading of the Lord. Hundreds of workers and missionaries will be represented in it. We wish no human writer to receive any honor but that it might be all to the glory of God, and that it may voice the power and presence of Almighty God who is moving on the people in Los Angeles and over the world. We start with not a cent in sight, but in the little upper room office above the mission on Azusa Street, we dropped on our knees and asked Him to send the means to publish the paper. In a short time, the money began to be sent in. No debt will be incurred. The paper will only be published as the money comes in advance." 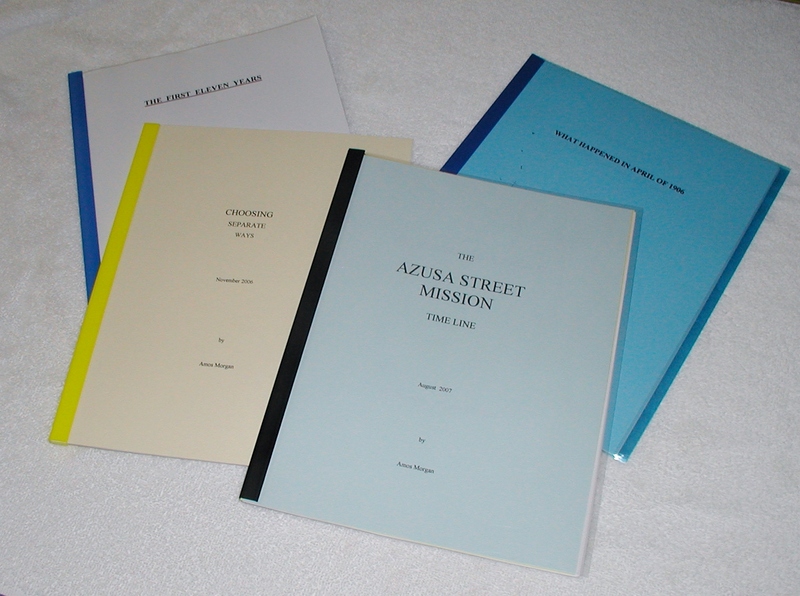 THE PURCHASE OF THE AZUSA MISSION. "The lot and buildings at 312 Azusa Street have been purchased by the Apostolic Faith Mission, and five Holy Ghost men have been elected as trustees, who hold the property. We believe the Lord chose this spot for His work, for He has wonderfully poured out His Spirit in the mission, which started about a year ago from cottage prayer meetings where the Pentecost first fell. Now, through Spirit baptized ones who have gone out, and through papers published here, there has been raised up a mighty host. Praise God! The property was purchased for $15,000, and $4,000 has already been paid down on it. Any friends wishing to have a share in buying this Mission for the Lord may send offerings to Bro. Reuben Clark, who is secretary of the board of trustees. Address 312 Azusa St., Los Angeles. "It was necessary to buy this mission as a headquarters for the work, in order to hold it, as it would soon have been sold for other purposes. The situation is favorable, being centrally located and in surroundings where no one will be disturbed by prayers or shouts going up sometimes all night. Praise God! The Mission building was formerly a place of worship where souls had been saved years ago, and the spot thus made sacred; and during the past year, hundreds have been saved, sanctified, healed, and baptized with the Holy Ghost." "What hath God Wrought? In two precious years since the Lord poured out the Pentecost in Los Angeles in a little cottage on Bonnie Brae Street, He has spread it around the world. Hallelujah. Many are rejoicing with joy unspeakable for the great blessings that God is pouring out in this latter rain. Many saved, sanctified, healed of disease and baptized with the Holy Ghost and fire. Many happy families filled with the Spirit are working for Jesus. 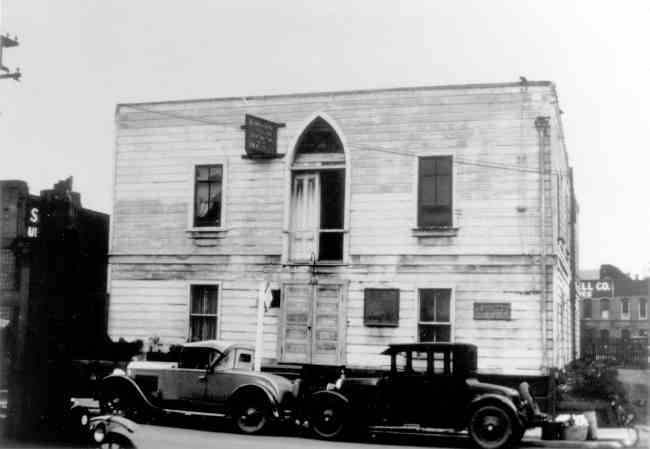 Soon after the Pentecost fell, the saints rented the lower room in the old building on Azusa Street, which has been much blest of God. To Him be all the glory and praise. When the place was about to be sold so that the Mission would have to move, the saints agreed to purchase it with three years' time to pay the $15,000, expecting the Lord to send the money all in before that time, and He has done it and answered our prayers in a wonderful way. We humbly thank God. We love to think of the blessed old "Manger Home" where so many of us have received the baptism of the Holy Ghost. Many saints love the spot and will rejoice that God has given it to us." We believe that afternoon tarrying prayer meetings began there about the first of April 1906. About April 14 the lower floor was rented. By September, the second floor had been secured also. This is a bit of speculation, but how could you rent rooms to anyone if the rooms were above a church where one might be “disturbed by prayers or shouts going up sometimes all night?” Including the upstairs in the deal may have been the only available option to the owner, thus we speculate. February 1907 they reported purchase of the building to keep it from being sold out from under them, paying $4,000 down and agreeing to pay the balance within three years. Negotiations for the building may have begun before the end of 1906, but the first report in the paper appeared as above. By April 1908, the mortgage was paid off. This was in less than half of the allotted time. The pay-off was reported in the May issue of the paper. It was time for church and the crowd came, but the doors of Azusa Mission were padlocked shut. A new era had begun. By the time the dust had settled, so to speak, Azusa had become a small, mostly black mission with mostly the same people who first met there five years earlier. The ruckus had been participated when William Durham, a Chicago area evangelist, came to Los Angeles and tried to unseat Seymour and replace him as Azusa pastor. A padlock kept the charismatic preacher out, but it could not keep the congregation in. Durham had stolen the heart of the congregation and took most of them, and the name Apostolic Faith, with them, to a rented hall. This was a major turn of events in the affairs of Old Azusa Mission; it was never the same. Occasionally some of the well-known people who had attended there at the beginning would return to reminisce, but the former splendor had dissipated. Seymour reported having chest pains and died of a heart attack within a few days. He had specified that his successor be a man of color, but instead of a man, his wife Jennie, became pastor. Both finances and attendance began a gradual decline. Larry Martin reports that, in a repeat of history, another white man came to Azusa in 1930-1931 and tried to unseat Jennie Seymour and take over as pastor. The city of Los Angeles condemned the old church as a fire hazard and razed it in 1931. Whereupon Jennie held cottage meetings for a couple of years until her health caused her to give it up. She died July 1936. Many people have already tried to map the time line for the revival at Azusa and consequently there are already many answers, but not too much agreement. To help us understand why so many different answers, we must remember that there were various phases of Azusa itself, and then it becomes more understandable why the various answers. Also, let’s consider that we do not even have a uniform definition of the word ‘revival.’ For instance, when you pass a small community church and the reader board says, “REVIVAL JUNE 1 TO 27,” do you ever wonder why they did not say June 1 TO SEPTEMBER 27? Wouldn’t that be better? Did they run out of letters before they could spell September? Does the size of the congregation determine whether or not it is a revival? If you visit a church in April and twenty percent of the congregation are seekers for the Holy Spirit baptism, is that a revival? If you come back in June and all the same people are still there, but now one hundred percent of the people have already received the Holy Ghost and no one is seeking any longer, is that a revival? How many people does it take to make a revival? Azusa went through several phases so maybe we should content ourselves with trying to consider the phases and not worry so much about the definition of what revival might mean to each person. Or maybe we will use our own definition of revival. Seymour was a man who spent much time in prayer before ever coming from Houston, Texas to Los Angeles. For most of March, 1906, he gathered those about him who had an interest in prayer meetings, and he taught them that Sanctification was a second definite work of grace, but it was not the Baptism of the Holy Ghost, as had been taught by the Holiness movement in the late Eighteen Hundreds. He told them he had not received the baptism of the Holy Ghost, but that he was seeking for it with the biblical evidence of Acts 2:4 following. In early April, two more people came from Houston. They reinforced what Seymour had been teaching and joined in the prayer meetings. This resulted in greater interest and increased attendance, more prayers, fasting, and tarrying-meetings. Monday evening, April 9, 1906, at the prayer meeting on Bonnie Brae Street, several people (characterized as washer women) were baptized with the Holy Ghost with the Bible evidence as in Acts 2:4. Frank Bartleman4 had visited a prayer meeting on Bonnie Brea before, but he first visited Azusa on Thursday evening, April 19. At that time it had “…seats enough for possibly thirty people, if I remember rightly,” he said. He recalled there being about a dozen saints there when he arrived for the evening service. It was a white woman who invited Florence Crawford to her first Azusa meeting, perhaps May Evans, but we do not know. Upon arriving at Azusa for a Monday morning meeting Florence Crawford remembers there being “scarcely more than twenty people” present that morning. Thus we see that early on, the meetings at Azusa were lightly attended. However, as news of the meetings spread, the crowd began to grow. "Seekers for healing are usually taken upstairs and prayed for in the prayer room and many have been healed there. There is a larger room upstairs that is used for Bible study. A brother fittingly describes it in this way, "Upstairs is a long room, furnished with chairs and three California redwood planks, laid end to end on backless chairs. This is the Pentecostal upper room where sanctified souls seek Pentecostal fullness and go out speaking in new tongues." "There is a very sweet spirit of unity among Pentecostal missions in Los Angeles and workers in suburban towns. Every Monday morning, the ministers and workers from these different points meet together for prayer and counsel. The missions in Los Angeles are at 327 1/2 S. Spring, of which Bro. Fisher is pastor; 8th and Maple Ave., of which Bro. Pendleton is pastor; and 1321 E. 51st St., where Bro. and Sister Kent have charge. Workers from Long Beach, Pasadena, Clearwater, Anaheim, and other nearby places also come in. All are in one accord." "We must give God all the glory in this work. We must keep very humble at His feet. He recognizes no flesh, no color, and no names. We must not glory in Azusa Mission, nor in anything but the Lord Jesus Christ by whom the world is crucified unto us and we unto the world. One clarification; the mission at 8th and Maple is often referred to as Frank Bartleman’s church. In August 1906 he paid one month’s rent on a vacant church building and began holding services there. He did so because he took issue with Azusa for putting the name “Apostolic Faith” on the building. They failed God in doing so, he said. William Pendleton and a group from his holiness church were put out of their church for embracing the Pentecostal teachings, so Bartleman invited that group to join him, with Pendleton as co-pastor. Soon thereafter Bartleman resigned his co-pastorate position so he would be free to write and pursue personal evangelism. Thus 8th and Maple became Pendleton’s church in a very short time and it was in full fellowship with Azusa and the other Apostolic Faith missions in the area as noted before. Within a couple of years Bartleman began to again include Azusa in his church visitation circuit. Brother Seymour when he was in Zion City wrote, "People here receive the baptism in their pews while the service is going on and sometimes scores of them receive it. It is the sweetest thing you want to see. It reminds me of old Azusa ten months ago. The people that receive the baptism seem so happy, they remind me of our people at home. There are little children from six years and on up who have the baptism with the Holy Ghost, just as we have it in Los Angeles. Praise our God. This is another Azusa. It would do you good to hear these people speak under the power of the Holy Ghost. Some of them converse in tongues. Brother Tom [Hezmalhalch] has never lost the spirit of the Azusa. He is still fired up the same as ever. Everywhere I have traveled among our baptized souls, they seem to have such joy and freedom in the Holy Ghost." -Address "The Haven," Zion City, Ill. The preceding was probably written in July of 1907, so how long ago would ten months be? It looks like about September of 1906 from here. Thus we could reasonably expect that the peak of the revival occurred in about five months and the decline was somewhat more gradual. If a revival has a peak, does that infer that it has a build-up and a decline? Does that detract from the revival? If it does, we somehow miss the point. Azusa had a mighty revival of years duration. If by trying to identify a ‘peak’ we lessen the impact or the power of that revival, then an injustice has been done. No, that is not the intended implication. But, if we are looking for a peak, it appears that we have found one as seen by through Seymour’s eyes. With the lowered influx of seekers and the rapid spread of Pentecost, some of the original staff of Azusa joined the outward movement. We notice that in the summer of 1907, Glenn Cook was conducting a camp meeting in Lamont, Oklahoma and Florence Crawford was conducting a camp meeting in Portland, Oregon although both were listed on the Azusa administrative board with duties and responsibilities back in California. In the first part of January 1908, Florence Crawford received a letter from Portland offering her the keys to Pastor John Glassco’s church. Portland had a great revival during her visits there to Glassco’s church in December 1906 and in a camp meeting in 1907. The idea of moving there sounded interesting to her (she was a native Oregonian) so she made it the object of prayer. After getting an answer to her prayer, she immediately began preparing for the move to Portland. Some history writers try to place the responsibility for the decline at Azusa on Florence Crawford’s departure, but this requires that we overlook some rather important factors. The Pentecostal revival started at Azusa Street Mission, but it quickly spread worldwide. By the end of May 1908, many of those originally listed as members of the administrative board had moved beyond the boundaries of Los Angeles. This exodus also included Lucy Farrow who, though not listed as a part of the administration of Azusa, played a crucial role in the early revival. She moved back home to Texas about a week after the marriage of William Seymour and Jennie Moore in mid May 1908. Could we fault her for returning home to Texas and say that she caused the revival to diminish? That would be unthinkable. Clara Lum decided to move to Portland. She had relatives in Oregon. This meant that a publishing of the church paper, The Apostolic Faith, would go with her to Portland. We note that Kansas and Texas locations were also publishing The Apostolic Faith paper at that time. She left more copies of the complete mailing list in Los Angeles than she took with her to Portland so that Azusa could still publish a paper from Los Angeles. Indications are that she did not really expect it to happen, but that she would leave for others to decide. Refer to Choosing Separate Ways for a report on the efforts of someone in Los Angeles to produce a paper in Los Angeles without the guiding hand of Lum. This move of Crawford and Lum has been so vilified that it distorts our understanding of history and throws the time line into a hapless fog. In the interest of resurrecting the time line, we need to take time out to see just what did happen. During January 1908, Crawford accepted an invitation to assume the leadership of Pastor John Glassco’s mission in Portland, Oregon. Clara Lum decided to move to Portland also. Her decision occurred sometime between January and May 1908. To an extent greater than generally acknowledged, Lum and Crawford had worked together on the paper. In her book, The Women of Azusa Street, Estrelda Alexander notes that Florence Crawford was second only to William Seymour in the number of signed articles in the publication The Apostolic Faith. William Seymour and Jennie Moore were married about May18, 1908. Many white people and also some of the black people moved from Azusa to the Upper Room Mission, or other missions in Los Angeles, during the summer of 1908. October of 1909, Jennie Seymour, along with two other members of the board at Azusa, went to Portland to assist in the incorporation of the church there as an affiliate Apostolic Faith Mission. There is no record that William Seymour went with the three board members on that trip. William Durham went to the Azusa Mission in mid-February 1911 to promote his “New Light” doctrine and tried to unseat Seymour and replace him as Azusa pastor. About May 2, 1911 Seymour padlocked the mission doors, but it was too late. Most (estimated at about 600) of the white people followed Durham to a newly rented location, taking the name Apostolic Faith with them. Most of these white people were newly returned to Azusa to hear Durham’s charismatic preaching. Elmer Fisher’s church also suffered a significant loss of members to Durham. He closed the mission at 327 ½ S. Spring Street and opened at a new location on Mercantile Street. Crawford moved quickly to contact all the affiliated churches along the west coast and determine whether they would join with her in opposing the “New Light” doctrine. In the summer of 1911, Crawford opened a mission at 115 East First Street in Los Angeles and installed Herb Green as pastor. This was in response to the loss of people from both Azusa and the Upper Room Mission to Durham’s church. In her view, if you were maintaining the original doctrines diligently, your congregation should not leave you for something new. The Apostolic Faith was about a set of doctrines believed to be in accordance with the teaching of the Apostles. A worldwide revival had been launched with a firm belief in those doctrines. Seymour came to Portland probably in mid-summer 1911 and said Crawford was trying to assume his leadership. He demanded that all mail addressed to The Apostolic Faith be forwarded to Los Angeles and that he be given the current mailing list (which had tripled in size during the three years in Portland.) He also rescinded Ernest William’s ministerial license while in Portland because Williams, when asked, indicated that he would continue to preach in the Portland church. We cannot establish a more complete time line for the events of 1911 except as already noted. At the invitation of a friend, Ione Nix (who would later become my mother-in-law) first attended the mission on 115 E. First Street on September 17, 1911, but we do not know just how long it had been in existence before that. Enter Vanzant; he lived in Portland, Oregon, had never been to Azusa, and knew no one there. But he was very much anti-Pentecostal and so was looking for some fault. His story is that he learned from the Portland mission that they had stolen the national and international mailing list from Azusa. Consider that the people at Azusa never even heard this now oft-told tale of the mailing list theft. Later, folks eager to find support for Vanzant’s phony story could not find it at Azusa, so they scraped together the above events sans the time line to produce the following story (our wording). Wow, some story! A few researchers and writers are reviewing the time line and the lack of support for Vanzant’s story there in Los Angeles, so eventually we expect to see this chapter revisited with a more factual presentation of Azusa history. The question is being asked how Jennie Seymour could have produced a notarized signature in May 1908 for October 11, 1909 and how William’s license could have been revoked in Portland two years before he moved there. If not that, are they insinuating that it took Seymour three years to discover that his mailing list was missing and go looking for it? That is a highly unflattering and unreasonable thing to portend. Does that make sense? It appears those who bought into Durham’s ‘New Light’ could not bring themselves to say that he it was who pulled the rug from under Seymour. Thus Crawford, who called the ‘New Light’ “a dangerous delusion and heresy”, has become a scapegoat for Durham’s actions. The marriage of William and Jennie Seymour had a gradual, but steady effect on the affairs of Azusa. She wanted Seymour to assume a greater, stronger leadership role for himself.5 She also wanted black saints to fill more of the leadership positions. So after their marriage, the majority of leadership positions gradually shifted from white to black people. Azusa began among a mostly black group and quickly spread to an international movement embracing many cultures, races, and languages. We cannot see anywhere that God made any distinction. And race was never an issue between Seymour and Crawford. But let’s examine the influence of Jennie Seymour just a little more closely. George Studd6 wrote of Azusa in August 1908 that, even though white people still attend the services, the mission was “entirely controlled (humanly speaking) by blacks”. While this shift from mixed to black administration was not documented within the church itself until 1914, it was begun in 1908 according to this note from Studd who himself began attending Azusa less and less frequently that summer. Some have supposed that the Upper Room mission at 327 ½ S. Spring Street was opened at about this time because of the migration of people from Azusa to that mission, but the Upper Room mission was opened in 1906 and this was 1908. The existence of the Upper Room Mission was reported in the January 1907 issue of The Apostolic Faith, so this was a new migration. Note that we never declared that the marriage of Seymour was not one of the reasons why some people moved away from Azusa, but claiming that Lum was motivated by romantic jealousy is baseless. We conclude that perhaps May 18, 1908, along with other afore mentioned conditions, ushered in a new era at Azusa and diverted attention away from the open revival there. That was one hundred years ago so we cannot really tell. So what about the "second peak" or "second wave" of the Azusa revival? In mid-February, 1911 William Durham came to town. He said he believed in sanctification, but not as a second application of the Blood of Jesus to our hearts. Everything that was spiritually required should all be accomplished at the same time with a single application of Jesus' Blood, he said. Anyway, Durham became more and more popular until he challenged Seymour for the pastorate of Azusa mission. Many who had dropped out of Azusa began to return to hear the white charismatic preacher. Seymour padlocked the Azusa doors on about May 2, 1911 whereupon Frank Bartleman helped Durham locate a large hall to rent for his newly acquired congregation. Then almost all the white members of the Azusa congregation (many of them recently returned to Azusa) followed him there, thus rendering Azusa a much smaller and mostly black congregation. Was that a revival? Well, what is your definition? About two years later, that same congregation who left Azusa with Durham, embraced the "Jesus Only", or Oneness, doctrine and called that a revival also. Attendance had risen temporarily at Azusa and that was the so-called second peak of the revival. It could more appropriately be called a re-conversion of former Azusa attendees to the "one work, or New Light," teaching that was in turn followed by their further conversion to the so-called Oneness Work. They were discrediting their former testimony that they had been saved, sanctified, and baptized with the Holy Ghost. They were becoming unsanctified according to the original Azusa teaching. Thus the Azusa revival ended completely. Charles Parham used the name Apostolic Faith to describe a set of beliefs that he said was undenominational and non-sectarian; it was Apostolic Faith. He also published a periodical using the same name. This was before January 1, 1901 when Agnes (Ozman) LaBerge was baptized with the Holy Ghost in Parham’s Bible School in Topeka, Kansas. In Los Angeles in the fall of 1906 and in Houston, Texas in 1907, Charles Parham fell into disfavor with most of his former followers. Gradually, the word Pentecostal replaced the words Apostolic Faith as an undenominational and non-sectarian set of beliefs. When the Portland, Oregon church led by Florence Crawford was incorporated in Oregon in 1909 it was listed as “Apostolic Faith Mission of Portland, Oregon.” Three members from the Azusa “Apostolic Faith” signed the incorporation in Portland on October 11, 1909. When Durham took most of the Azusa congregation from Seymour in May 1911, they also took the name Apostolic Faith. Connections between Charles Parham’s Apostolic Faith and William Seymour’s Apostolic Faith were severed in the fall of 1906. Connections between William Seymour’s Apostolic Faith and William Durham’s Apostolic Faith were severed from the beginning in May 1911. Connections between William Seymour’s Apostolic Faith and Florence Crawford’s Apostolic Faith were severed in mid 1911. Reports that Crawford stole the name Apostolic Faith from Seymour are based upon a misunderstanding of the time line. In April of 1906, Parham did not object to Seymour using the name Apostolic Faith. In October 1909, Seymour did not object to Crawford using that name. The word ‘stole’ appears to be motivated by something other than facts. TIME LINE ON "NEW LIGHT"
Being a firm believer in the Holiness doctrine of sanctification, it is not probable that I could give an unbiased version of the ‘New Light’ teaching on sanctification, but consider that the reverse is also true. How can one who does not accept the holiness teaching on sanctification fairly describe its tenants? So just to be fair, keep reading. Remember that God told Moses to tell the children of Israel to kill the Passover Lamb, catch the blood in a basin, dip a bunch of hyssop into the blood and strike it on the lintel above the door and on the two side posts, Ex. 12:21-23. Would we take a chance on the lives of our first born by deciding a single application of the blood would be more appropriate than three? Obedience is better than sacrifice and failure to obey is the sin of unbelief. And in the temple also, blood was offered at two alters (one brass and the other gold) and thirdly, before the Mercy Seat on the Day of Atonement. Can we find fault with God’s directions to make a triple application of blood in both of these types of His plan for our salvation? If we understand the book of Hebrews, we would note that the third application of blood in the temple represented the Holy Ghost experience, Heb. 9:7,8. Christ prescribed a Trinitarian baptism for his followers, but in a pattern consistent with the teachings of Durham, his followers (those whom he took from Azusa) decided upon a Unitarian baptism. While on the cross, Christ made seven utterances or statements (sometimes referred to as the seven last words of Christ.) One of these statements was, “It is finished.” This is a statement without a stated subject. To the followers of John Calvin (7/10/1506 – 5/27/1564), the father of Calvinism, it means that it is no longer necessary for Christians to live a Christian life. The ‘Finished Work of Calvary’ substitutes Christ’s righteousness for our own, so God does not see our unrighteousness but, say they, He sees Christ’s righteousness in us without any works of righteousness on our part. We may continue in sin that grace may abound. Durham borrowed from this idea saying that the ‘Finished Work of Calvary’ means that cleansing from all sin, whether committed by us or inherited from Adam, was finished on the cross as a single act when Jesus uttered those words. Obtained the keys of Death, Hell, and the Grave. Resurrected Himself from the dead and arose on Easter. Ascended into heaven and presented himself before the Father as a sacrifice for the sins of the world. Notice that on Easter Morning Jesus told Mary Magdalene, “Touch me not for I have not yet ascended to my Father…” This was three days after He had said “It is finished.” Since Jesus gave no subject for the words “It is finished.” it appears rather arbitrary that John Calvin and William Durham each knew what He meant, but they did not quite agree with each other. A pattern begins to emerge. If you take isolated words and place them in another context, you have a wide-open field. An option that we have to help avoid this kind of confusion on the many winds of doctrine is to compare scripture with scripture. Refer back to the second paragraph of this chapter for scriptures that I do not believe agree with Durham’s assertions. Also in Jesus’ intercessory prayer in St. John, chapter 17, we notice that He was praying for those who were no longer of the world, but were His disciples. He prayed for them, not for those of the world, that the Father would sanctify them. In the late 1800's, Holiness associations sprang up across the country because the Methodist Church, keeper of the Wesleyan teaching of holiness sanctification, had begun to focus more on social issues and less on Christian living. Then, in response to pressure from the holiness associations to expound more on holiness sanctification, the Methodist Church declared that it would no longer teach sanctification at all. It was too controversial and too much misunderstood, they said. We can only agree with a part of that assessment. Indeed, questions about holy living had begun to consider if men should, or should not wear beards. And the same question arose about neckties. Well, anyway there was an exodus of people from the Methodist Church to Holiness churches that were springing up across the nation. These new Holiness churches taught salvation through repentance, restitution, Faith in Jesus, and regeneration. The Blood of Jesus was applied to our hearts thus cleansing us from all committed sins (plural). The Old Testament type of this experience was in the sin and trespass offerings made at the altar of brass in the courts of the tabernacle. Next, as taught by the Holiness churches, we were sanctified and baptized with the Holy Ghost by a second application of the Blood of Jesus at the Golden Altar in the Holy Place. This was the burnt offering and we were cleansed from the Adamic nature of sin (singular) and filled with the Holy Spirit. Sometimes people were so blessed in revivals that they spoke in tongues and that was regarded as a very special, personal blessing. Then, on January 1, 1901 in Topeka, Kansas, Agnes Ozman, a student at Charles Parham's Bible School prayed that if she had not been baptized with the Holy Ghost when she was sanctified, that she might be baptized with the Holy Ghost with the bible evidence of Acts 2:4. Thus dawned a new day of a new era. The preceding incident at Topeka, Kansas was cited on the first page of the first issue of The Apostolic Faith paper from Azusa in September 1906. Those teachings have continued unbroken from then until now by the Apostolic Faith Mission of Portland, Oregon. However, we learn that in the late spring of 1907 Glenn Cook, one of those on the administrative board at Azusa, privately disagreed with that doctrine, but was willing to bide his time and not go public with his dissent at that time. Later, he became a follower of William Durham. "Behold, are not all these which speak Galilaeans? And how hear we every man in our own tongue, wherein we were born? Parthians, and Medes, and Elamites, and the dwellers in Mesopotamia, and in Judaea, and Cappadocia, in Pontus, and Asia, Phrygia, and Pamphylia, in Egypt, and in the parts of Libya about Cyrene, and strangers of Rome, Jews and proselytes, Cretes and Arabians, we do hear them speak in our tongues the wonderful works of God. For a dissertation on the difference between glossolalia and ‘as in Acts 2:4, see my earlier booklet, Choosing Separate Ways. From the foregoing we see that today we can choose from a menu of beliefs, and we choose to believe what we want. Should we not consult the Bible for guidance? "Remember the good ol' days?" we sometimes ask. Why is it that hard times of the present become good ol' days in memory? Perhaps it is to keep us from drowning ourselves in self-pity and loss of hope. Some of the good ol' days at Azusa seem to have more standing in memory than in fact. So guess what? We need a time line to help us sort out how much of history was recorded at the time and how much grew into being somewhere down memory lane, but this will not be easy. We can only speculate from the evidences we see. Lucy Farrow came from Houston, Texas during the first part of April 1906 and moved back to Houston before the end of May 1908, almost two years and two months later. Her contribution to the Azusa Revival was truly important, but after her departure, her stature outgrew the recorded facts. One account has her attending a Bible School in Kansas. Now, no one has written a book saying, “I was a student at a Bible School in Kansas and no one there was named Lucy Farrow,” but the facts that were recorded do not exactly support this assertion. Of even greater interest is what part did Ed Lee play in the revival. The same author relates that on arrival in Los Angeles, Farrow went to the Lee home for dinner. When Ed got home from work and found her there, “he fell on his knees at her feet and said, “Sister, if you will lay your hands on me I believe I will get my Baptism right now.” Not then, but later that evening while seated at the dinner table, she rose from her seat, walked over to him and said, “The Lord tells me to lay hands on you for the Holy Ghost.” He fell from his chair and began to speak in tongues. When he arrived at the Asbery home for the prayer meeting that evening, he raised his hands and began to speak in tongues. At that, the six people who were already on their knees praying all began to speak in tongues.” In the church paper, The Apostolic Faith, printed in September, we have Seymour saying that Pentecost began in a cottage prayer meeting on Bonnie Brae. Was he trying to belittle Ed Lee and Lucy Farrow? I think not. My guess (and it is only a guess) is that the story about Ed Lee was five or more years in the making. Another rather interesting story relates that two white women introduced racial strife at Azusa. It seems they wanted to marry Seymour and exited Azusa when he chose to marry Jennie Moore, a black woman, instead. This story had to wait for a third of a century for all the principals to die before it could be published. It is, of course, completely false. Crawford, one of the two, had separated from her second husband, Frank Crawford, in accordance with Seymour’s teaching that no one could have two living companions. The other person, Lum, had chosen to give her time to help promote the gospel and not to marry and take on the responsibilities of raising a family. Next let's look inward and see how the Portland trip by Seymour in 1911 affected us (in Portland). Others have their story of a mailing list theft. Then there are the time-embellished stories and the stories of racial strife based upon a claim of hoped-for interracial marriages. And we Portlanders have our story of Seymour's letting down on sanctification. When Ernest Williams was 93 years old, he said the confrontation that occurred when Seymour came to Portland was about who was the leader. He did not remember anything about doctrinal differences. You see, Seymour really came to Portland in 1911 to accuse Crawford of trying to assume his leadership role while she was dealing with a teaching called "New Light," a teaching that sanctification was not a second definite work of grace. Now, washing dirty laundry in public has always been poor policy, so many people in Portland never knew all the inside details of what was going on. Evangelizing was still the first order of business here; consequently many of us never even heard all the ugly details. We only knew that some were trying to tear down the original doctrines taught at the beginning from the Azusa revival and that Mr. Seymour came to town to challenge Sister Crawford. Thus we associate the 1911 trip by Seymour to Portland with the fight against the "New Light" teaching on sanctification. It was all one event in our time line, it all occurred at the same time. But to be honest, after learning more of the details of it, we still wonder, why did Seymour lose his congregation to the "New Light" while the Portland congregation was apparently unaffected by it? Durham came to Portland and opened a rival mission to take Crawford's congregation from her here also, but his efforts led to complete failure in Portland. It was judged then (and today) that if Seymour had strongly maintained his original teaching on sanctification, Durham would have had no more effect there than he did in Portland. When Seymour arrived in Los Angeles near the end of February 1906, he faced both rejection and ejection but he just kept on keeping on. And not all his problems disappeared on April 9, but he still kept on. We will recount a few of the toils of the road that beset his efforts as a mighty revival sprang up and spread worldwide. In August of 1906 they put the Name “Apostolic Faith Gospel Mission” on the building in anticipation of a visit from Charles Parham. Frank Bartleman circulated through several churches and missions as an independent preacher and contributor of articles for several religious magazines. When the name appeared on Azusa he took offence saying that they had failed God by becoming denominational. Further he disputed a valid connection between Texas and the Azusa Mission revival. He proposed opening his own church that would remain independent and would “go deeper” spiritually. As far as we know this had no effect on Azusa. Instead, Bartleman quickly turned that church over to William Pendleton, a holiness preacher and his congregation, who had been turned out of the Holiness church for accepting Pentecostal teachings. Pendleton swung into line with Azusa as mentioned in chapter two. Within about two years Bartleman was again including Azusa on his rounds of church visitation. Parham came to Azusa in October 1906 and tried to introduce a doctrine of ‘No Eternal Hell,’ or ‘Conditional Immortality.’ For this he was ejected (or locked out), so he spread stories of being “repulsed” by what was happening at Azusa and opened a rival mission. Again, if that had any effect on Azusa, it was not apparent. Before accepting stories by Parham and from the newspapers of a wild and fanatical atmosphere at Azusa, we should read some of the sermons preached by Seymour. They are well thought-out and were delivered with the emotions “of a fence post” according to witnesses. Ernest Williams first arrives at Azusa during an altar service. He said, “I wish I could describe what I saw. Prayer and worship were everywhere. The altar area was filled with seekers; some were kneeling; others were prone on the floor; some were speaking in tongues. Everyone was doing something; all seemingly were lost in God. I simply stood and looked, for I had never seen anything like it.” See Choosing Separate Ways for more of his testimony. A major impact on Azusa was the marriage of William Seymour and Jennie Moore in May 1908. As noted before, her influence was to strengthen the leadership role of her husband and secure greater authority and control for the black saints. Does this work stand the same in doctrine as at the beginning? Yes, since God gave us the truth from heaven in the beginning of this “latter rain,” this work has stood against compromise on all lines. God showed there would be a great sifting and siftings came. First on the line of the Bible evidence of the baptism of the Holy Ghost, many who started weakened and fell out by the way, but the truth was established. Then what a fight we had on the question of women preaching. They said that women had no right to preach the Gospel. That thing had to be fought through, and now there are as many women preaching in the power of the Spirit as there are men. Then came the fight on the question of divorce and re-marriage. This work stood on the Word, that no person can have two living companions, and God has wonderfully honored that truth. And today the same truth is on trial for which Wesley was tried 150 years ago, the doctrine of the second work of grace. Many are trying to do away with sanctification, saying that we are justified and sanctified at the same work of grace. It is a dangerous delusion and heresy that has caused many to lose their salvation. They are saying that the uprisings in the soul can never be taken out, that we can never be delivered from inbred sin; but we preach, testify and experience that the old nature is removed, eradicated, and destroyed absolutely. Of the four items she enumerated, we know little of the first two and whether they had a significant effect upon the attendance at Azusa. But apparently the question of divorce and re-marriage did send some people away. Crawford was herself affected by this teaching. She had married as a teenager in Oregon and then remarried in Los Angeles and had two children. She did what is called “walking in the light.” Her new address was listed in the church paper with no explanation, but those familiar with the situation knew what that meant. Here is that teaching as it appeared at the time. Here is the result of the foregoing teaching. The fourth item (New Light) completely devastated Azusa as already noted in chapters two and four. Some things cannot be tied to a time line. They exist in the eyes of the beholder and thus elude the element of time. We thought it fitting to include one such story. "To "prophesy" and to "speak with tongues" are, in the language of Rev. Mr. Parham and his followers, two very distinct propositions. When they "prophesy" they merely testify to what the Lord has done for them. When they "speak with tongues" they employ gifts with which they are suddenly endowed from on high, speaking numerous different foreign languages..."
"Last night neither the marvelously gifted Miss Ozman nor any of the rest were able to speak anything but English, and they were obliged to confine themselves to prophesying..."
"Rev. Mr. Parham and others were asked to explain why no one was "inspired" - this is a word they frequently employ - to speak with tongues last night. "Oh," was the ready reply, "we are moved at different times by the Lord's spirit, but we never can tell when we will be. This inspiration is sacred, it is divine and it is only given when the soul comes to the Lord hungering, thirsting and panting for truth. If we should try to satisfy the curiosity of others by making a display of these great gifts, we should infer His great anger, and bring damnation to our souls." Thus, from the very beginning, a display of tongues to satisfy curiosity or to show ones ability to do so, was considered an invitation to God’s anger and damnation, and so it is today among people of the Apostolic Faith Mission of Portland. So then, how is it that Lum regularly gave tongues demonstrations at Azusa? An Apostolic Faith minister whom I know personally had a physical problem and it was diagnosed as cancer. He prayed for divine healing and felt assured of God’s promise to completely heal him, but the cancer continued to grow. He would go to the altar and pray, reciting his belief that God had already promised divine healing. While in prayer he would again feel assured that God would heal him and the blessing of the Lord would come upon him and he would speak in tongues in prayer. But the cancer continued to grow. While working, he became involved in an accident that would leave him scarred for life. Taken by ambulance from the place of work to the hospital, the doctors offered that while he was there they would operate on the cancer as well as putting him back together. He told them to go ahead and take care of the damage from the accident, but God had already promised to heal the cancer, so just let it be. But, as before, the cancer continued to grow. Then one day he noticed the cancer had begun to shrink, and it continued to do so until he was completely recovered from it. His story closely parallels that of Clara Lum. Her testimony is given on page 8 of issue six, the ‘double issue’ (All other issues of The Apostolic Faith were just four pages long.) Lum had been sick, and while praying on her sickbed, she prayed and sang praises in tongues. This is biblical, see 1 Cor. 14:18,19. We can find no indication that she ever gave any demonstration of tongues speaking while standing in the meetings at Azusa. No support was cited for the allegation that she did so, and it appears to be in the eyes of the beholder of one who does not share the views of The Apostolic Faith. Of course we must all admit to a fault along this line. We can only see others through our own eyes, and a mote in our brother’s eye always seems much clearer than a beam in our own eye. I am an old man, but not that old. Everything in this booklet was history before I was born, so I know none of it from personal experience. Every thing I know was learned from others. The same is true for most other Azusa history writers. If you find a disagreement between this time line and the time lines of other writers, do not be surprised. We may have reviewed the same materials and arrive at different conclusions. There are, however, two points of which I am completely convinced. The Welsh Revival had an impact upon the city of Los Angeles. This was especially so in the case of the New Testament church of Pastor Smale. But there is no conclusive evidence to suggest that the Azusa revival would have occurred without the Apostolic Faith in 1901 in Topeka, Kansas. On the other hand, we never can tell ‘what might have been,’ but every thing necessary for the Azusa revival occurred at Azusa without dependence upon the welsh revival. And even more importantly, what did the people of Azusa say about it? Quote, “This work began about five years ago last January, when a company of people under the leadership of Chas. Parham, who were studying God's word, tarried for Pentecost in Topeka, Kan.” This is from page one of issue one published in September 1906. This is not to distract from the great revival of Wales. But it should settle it that Frank Bartleman was out of touch with the real history when he said the Azusa revival was born in the cradle of Wales. Not according to the people at Azusa. And who would better know? Stories of the mailing list theft from Los Angeles to Portland are not supported by any Los Angeles sources in any of the histories I have seen. They ONLY quote from Vanzant, an anti-Pentecostal writer who lived in Portland. In his book, he quotes from the Portland Apostolic Faith Paper that says, “We said it (the paper) was moved from Los Angeles when we should have stated we were starting a new Apostolic Faith of Portland, as nothing was moved except two lists of subscribers, leaving 20 complete lists of all subscribers in Los Angeles.” Someone in Los Angeles had made two separate attempts to start a paper from there without the able help of Crawford and Lum, so this clarification was in order. But with nothing more to go on than the foregoing quote, Vanzant wrestled the wording to effectively say, “We left 20 copies of the local Los Angeles mailing list there and took the National and International mailing list with us to Portland.” It did not say that. In a follow-up statement, Vanzant concedes, “Suppose they did leave twenty complete lists of all in Los Angeles, what right had they to take any thing, …” Here he is switching gears and backtracking, but still assuming he knew details which he never even heard of. We could easily show their rights by repeating that part of history, but will not do so here. As a preface, Vanzant said, "W. J. Seymour opened up the Apostolic Faith work in Los Angeles, and he and his people were publishing a paper called "The Apostolic Faith", which carried his name as editor." This is not a true statement. No name was listed as editor of The Apostolic Faith paper published in Los Angeles. Later he reiterated the same thing saying, "The Los Angeles paper carried Seymour's name as the editor, ..., but, "The Apostolic Faith" of Portland has never carried the name of any one as editor, ..." Again, this is a half truth. No name was given as editor either in Los Angeles or in Portland. Vanzant also quoted from a mystery paper from Los Angeles issued at a later date, and supposedly over Seymour’s signature it said, “I must for the salvation of souls let it be known that the editor is still in Los Angeles, … and will not remove “The Apostolic Faith’ from Los Angeles, without letting subscribers and field workers know.” There are several copies of an issue 14 from Los Angeles that was published in June 1908. But, no one has ever heard of this later paper referenced by Vanzant. Such a paper may well have existed, but how can we trust Vanzant to say it was signed by Seymour. He was wrong at least two times out of three, and I do not believe him; his record forbids it. Also note the wording; it certainly does not sound like Seymour. We wonder how many souls would have been saved by knowing whom the editor really was and where he (or she) lived? In his book, The Mailing List Controversy, Richard Crayne observed that Vanzant received this later edition of the paper because his name was on the mailing list in Los Angeles. That is a thought worthy of serious consideration. Also consider why the complaint about the editor not being in Los Angeles but no mention of a missing mailing list if that was so? One final thought; some have criticized the Azusa leaders as being less well trained and organized than should be expected to carry on such a work. The question might be asked why did not God see that in the first place? James says if we become judges, we become judges of the law and not doers of the law. Perhaps God had the wisdom to make the right decision after all. When Jesus was only twelve years old He questioned with the doctors of the law, and when it came time to select the leaders of the New Testament church, he chose those who were not so well trained as those leaders with whom He had spoken as a twelve-year-old boy. Instead, He chose those who were called ‘ignorant’ and ‘unlearned’ as His leaders. God surely must know best. Surely it must have been Him that sent the Azusa revival and He must have considered all the ramifications. Should we find fault because He passed up some other group that we might have chosen; those we thought better educated? Not to worry. God it was who sent the revival first to Bonnie Brae Street and then to the Azusa mission. The Apostolic Faith, issues one through thirteen, published from Azusa in Los Angeles from September 1906 through May 1908, is the main source of information for this work. That material, published at that time, from that location, and by the people who were involved, takes precedence over all other materials from all other sources at all other times. Our understanding of an event may be judged faulty, but we deem this source of information to be the most accurate of all sources. Also this article includes materials from two prior booklets, What Happened in April 1906 and Choosing Separate Ways.